The Oshawa Museum (OM) preserves and promotes awareness and appreciation of Oshawa’s history for the education, enrichment and enjoyment of a diverse audience. As the only community museum in Oshawa we take great pride in showcasing the history of our city from the earliest First Nation occupation to the end of WWII. The OM is administered by the Oshawa Historical Society, a not for profit charitable institution, as an external agency of the City of Oshawa. Our collection is diverse and highlights include a photograph/postcard collection from the late Thomas Bouckley, newspaper microfilm dating to 1862, reference library featuring local history books, artifacts from the Henry, Robinson and Guy families and other early settlers, medical instrument collection, extensive camera collection, 7,000 item Grandview artifact collection and vast photograph collection depicting Oshawa events, places and personalities. The Oshawa Museum is an important heritage resource in Oshawa. As one of the few remaining historic neighbourhoods and Oshawa's only community museum, the four buildings that comprise the Museum are ideally situated to tell the story of Oshawa from its earliest native occupation to present times. By preserving, presenting and actively connecting people and communities with their past, history organizations make their communities more attractive places in which to work, live, and visit. 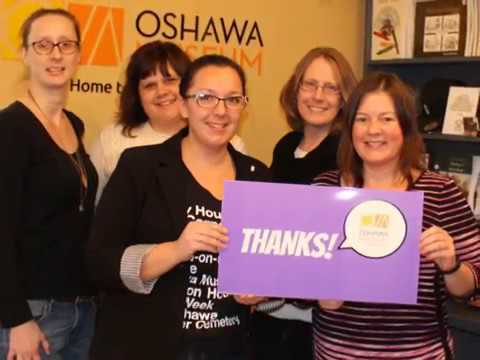 With astute leadership, compelling vision, engaged partners and resources sufficient to the task, the Oshawa Museum will continue to be a leader in promoting Oshawa's history. "“It is quite appropriate that my donation … was used to purchase the lamp as Smith Potteries does have a connection to my ancestry. .”"
"I get a great deal of satisfaction from supporting the museum and am happy to “continue my Uncle Earl’s work.” "